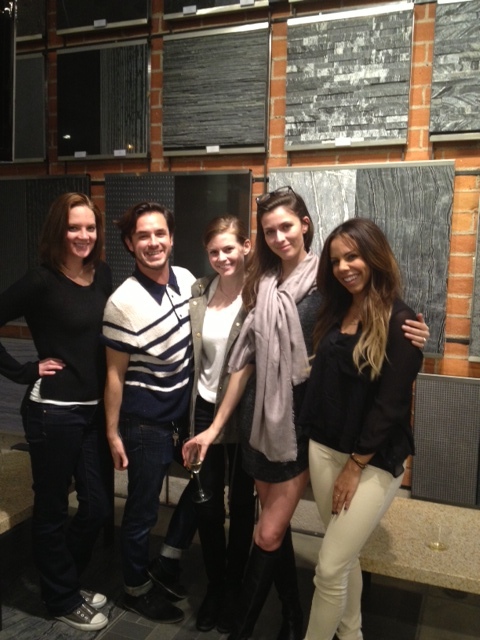 We had a blast catching up with Martyn Lawrence Bullard’s design team at SOLI Architectural Surfaces in West Hollywood this week! Marc Selwyn is pleased to announce Marc Selwyn Fine Art, a new gallery opening in Beverly Hills on Tuesday, February 18th in the historic former Al Grimmet’s Garage, a 1940s brick building on Little Santa Monica Boulevard. The gallery marks a return to Beverly Hills for Marc Selwyn, a veteran art dealer who was the former Director of PaceWildenstein in Beverly Hills and former West Coast Fine Arts Director at Sotheby’s. The 3,000 square foot gallery, designed by Frederick Fisher and Partners, will feature an intimate drawings gallery and a larger exhibition space filled with natural light. The gallery’s exhibition program will remain unchanged from Selwyn’s current gallery on Wilshire, focusing largely on established historic figures in painting, photography, and conceptual art. Selwyn will also continue to place important historical works in collections through his activity on the secondary market. Marc Selwyn Fine Art will open with a group show featuring Mel Bochner, Harry Callahan, Robert Heinecken, Richard Misrach, Robert Overby, and Alan Ruppersberg, among others. A major current trend in tiles got the spotlight on the Robb Report Home & Style last week, when readers got a preview of the Murano Glass tiles that are available at Soli Architectural Surfaces now, as well as an excellent tip on how to show them off using light. 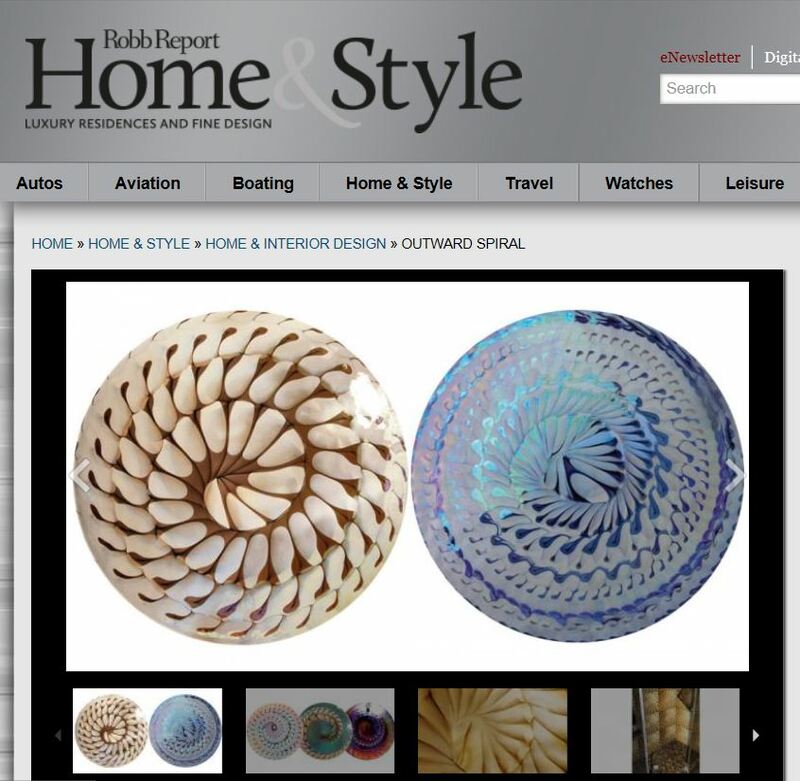 See more at: http://robbreport.com/home-and-design/outward-spiral. 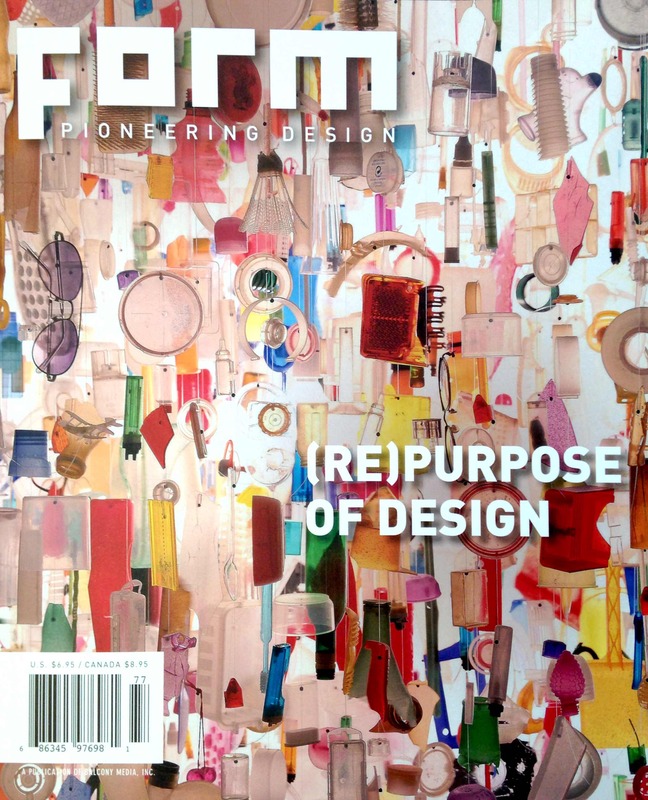 Posted on January 16, 2014 By Communication Arts + Design, Inc. in Beautiful! In a detailed photo album on SOLI Architectural Suraface’s Pinterest Page, you can see the many variations of delicate glass wall panels by Murano Glass. We can’t get enough of these calming, soothing designs that come in a range of colors and swirling designs. With the new year came the announcement from SOLI Architectural Surfaces that the West Hollywood showroom is now the exclusive distributor of this beautiful Italian-made glass in the U.S. Beautiful! 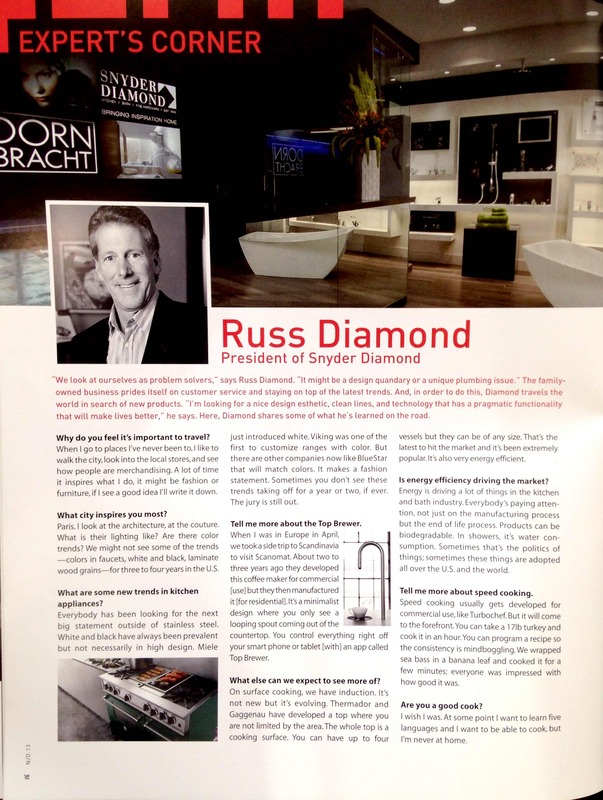 As a world traveler, Russ Diamond, President of Snyder Diamond, has plenty of tips to share in the December 2013 issue of FORM Magazine. He also talks new trends including “speed cooking.” Plus, how he discovered Top Brewer in Scandinavia. 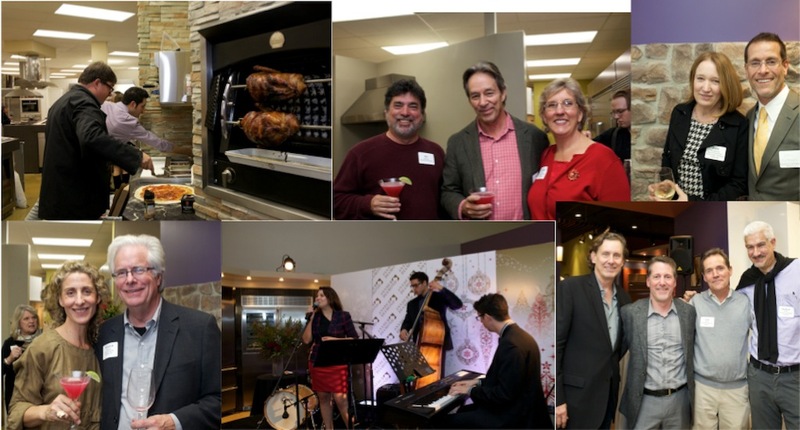 It’s this busy travel schedule that is just one of many reasons why Snyder Diamond is known worldwide for innovative and top trends in the Kitchen & Bath. Be sure to pick up a copy of the magazine! 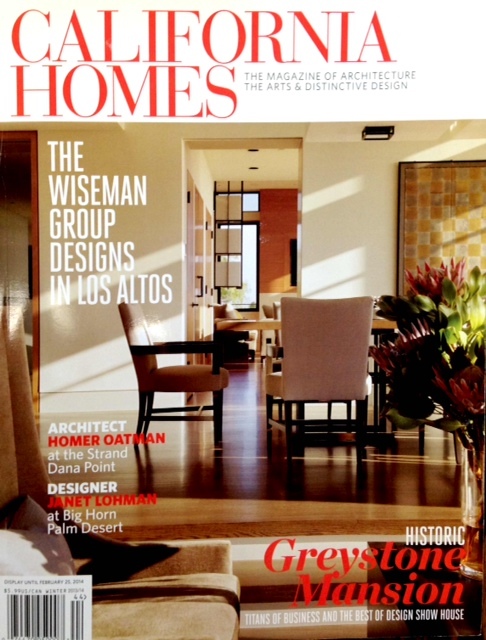 Architect Doug Burdge, and Burdge & Associates Architects, is profiled in California Homes’ Winter 2013-14 issue, on newsstands now. In the article, Burdge shares 7 Tips for Building on the Coast. 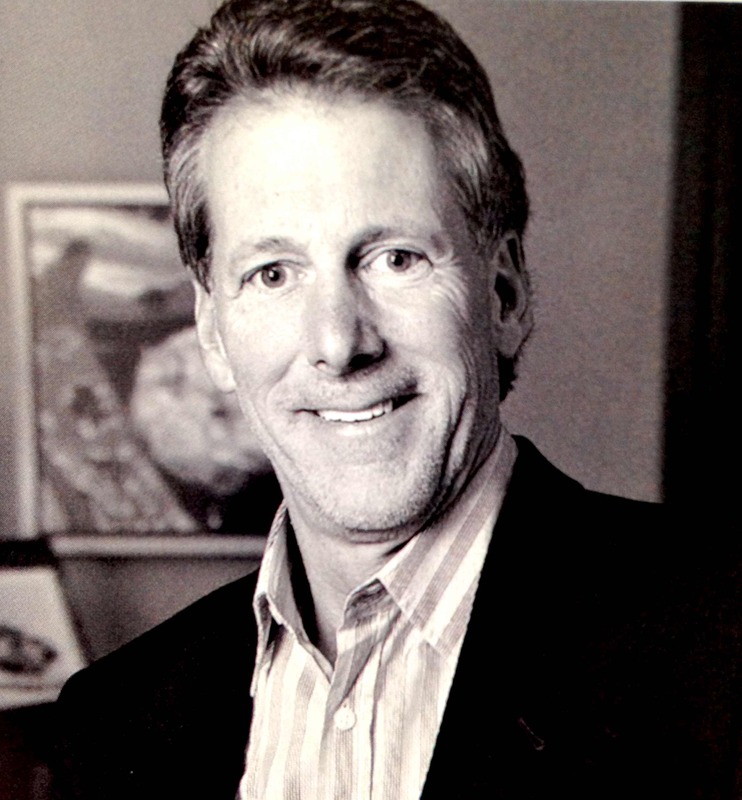 Did you know that he has built over 100 high-end homes in Malibu? 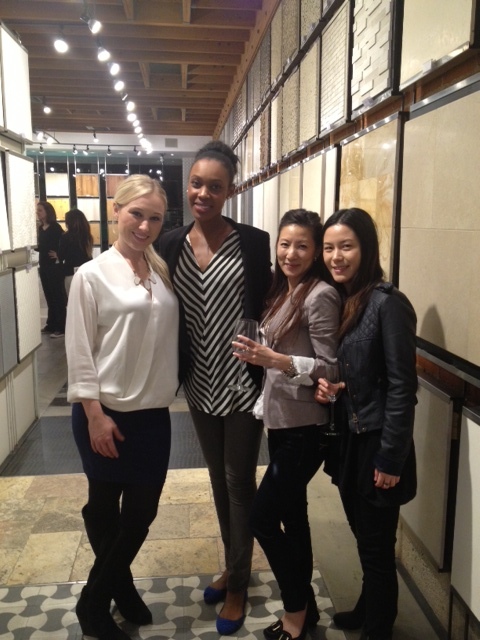 On December 18, 2013, we toasted to the holidays with members of the Southern California chapter of the Institute of Classical Architecture and Art and luminaries of the design community at Snyder Diamond in Santa Monica, Calif. Thin crust pizzas, grilled vegetables and more came out of the Wood Stone Home oven, courtesy of chef Chris Welch and team, and off the Sub Zero Wolf grill, courtesy of chef Edric Ocampo. The event was beautifully catered by Bread and Water. A live band played Christmas carols and holiday favorites, and voluntary donations were made to the Westside Food Bank. It was a truly festive occasion. Happy New Year! We couldn’t be more excited about the new year and all the wonderful things that are in store. Stay tuned!